Jose A. Torres is a Shareholder/Attorney at Cuevas, Garcia & Torres, P.A. His practice focuses primarily on Community Association Law, Construction Law and Litigation, including Civil, Commercial, and Real Estate litigation. He earned a Bachelor’s Degree in Political Science from Florida International University in Miami, FL in 2007, and a Juris Doctor from Nova Southeastern University Shepard Broad Law Center in Ft. Lauderdale, FL in 2011. Mr. Torres is admitted to practice in Florida. In law school, Mr. Torres was a student competitor for the Nova Trial Association and a founding member of the Tort Law Society. Additionally, he was a member of the Hispanic Law Student Association and the Criminal Law Society. 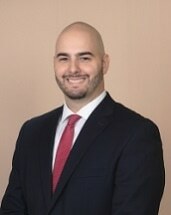 Mr. Torres is a member of the Florida Bar, American Bar Association, and the Young Lawyers Section of the Florida Bar.